Inspired and learned at age 12 from tricks in Wizard comics. Amateur card and close-up magician since then, initially with stage name "Siva". 50 years in printing trade before retiring. Hobbies: cabinet making and book binding. Magic Circle Reference Librarian since 1990. Died of heart attack. Invented Message from Hades (1953) and the Siva Count (5-as-4) by 1977 when published by Mentzer. Wrote Minds in Duplicate (1956, 32pp). Tricks in Pentagram , New Pentagram , Gen , Abra , Phoenix , Hugard's Magic Monthly , Pallbearers , Chronicles , Linking Ring , MUM , Pabular , Epilogue , Ibidem , and Technomagic . 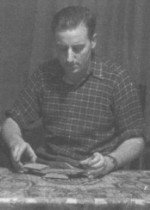 Sixty Years of Magic from the Private Notebooks of Jack Avis!